Use this page to quickly find the information you need. We also have a very robust search engine on this site in the event you are not able to find what you need. 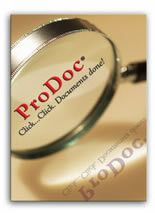 ProDoc System Overview – Provides a synopsis of our entire product line. ProDoc Systems for California – Find specific information about our California products here. ProDoc Systems for Florida – Find specific information about our Florida products here. ProDoc Systems for Texas – Find specific information about our Texas products here. National ProDoc Systems - Business Transactions Solution - Find specific information about our Business Transactions Solution (BTS) product here. PowerPacks – You will find specific information here about these additional timesavers. Small Office Suite – Learn more about our practice management software for small firms. eFiling – Find out more about our eFiling service for Texas state courts. Certified Mailer - We provide a quick and easy way to generate certified mailer labels. Why ProDoc - Read about what ProDoc can do for you. Why ProDoc is Unique in California - If you are a California attorney you've never seen anything like ProDoc... read here what makes us so unique. Customer Testimonials – See what ProDoc users say about our products. Company Overview – Provides you synopsis of this section. Contact Us – Find our address and phone number here as well as a link to send an email to a specific department. History – Learn how ProDoc grew from Alan Schoolcraft's (the founder of ProDoc) dream into the leading document automation software program today. Support Overview – A synopsis of the information available in this section. Read here about our free training options. Training Policies - Read about our polices regarding free training for ProDoc customers. FAQs – Answers to frequently asked questions about ProDoc. Computer-Based Training – View the interactive training programs on using our products. Tips & Tricks – A collection of ways to maximize the efficiency of ProDoc. System Requirements – A review of the hardware and software requirements for ProDoc. Quick Reference Cards – Provide concise instructions on using various features of ProDoc and Small Office Suite (SOS). User Documentation – Download user manuals on our various products. Overview– Provides a synopsis of this section. Articles – Provides a list of articles that could be of interest to subscribers and non-subscribers concerning document assembly, and estate planning. Forums – Post your questions about estate planning, Texas real estate, or Texas eFiling. Home Page – There’s no place like home. Search – Use our robust search engine to find specific information on our site. Privacy Statement – Find out about our policies regarding protecting your personal information.